As the flyer states – we’re going to hold a Two-Day Facebook Live event to introduce y’all to the benefits of being a Stampin’ Up! Demonstrator! Throughout the weekend, we’ll have 4 facebook live presentations scheduled (one from me, one from Amy Koenders, one from Sue Prather and one from Jaimie Babarczy) where we’ll talk about the Starter Kit offer, the benefits of being a Demonstrator, the specifics about how to join and why now is a SUPER time to join our team! In between will be some games – a few fun videos about being a part of the Stampin’ Up! family and plenty of time to ask questions! The “Join Our Team – Be Part of Our Story” event page will be open today, 4 February and will remain open at least thru the end of Sale-A-Bration. The event will kick-off on Friday, 8 Feb at 6:30 PM ET and there will be videos, share posts, giveaways for participation in the group and lots of chatter and discussion. It’s a great time to ask those burning questions you’ve got – or simply Lurk-and-Learn! Whatever works for you! The event will end on Saturday, 9 February at 6:30 PM ET. All giveaway drawings will be held on Sunday, 10 February in the evening so that people who couldn’t watch live can catch up and join the fun. The event page will remain up and open through at least the end of Sale-a-bration 2019 (maybe longer if y’all are really diggin’ it! – so you’ll be able to check back in – watch the videos again – see answers to your questions…and be primed to take advantage of the truly awesome Sale-A-Bration Joining opportunity! So – I TOLD you it was exciting! ALMOST as exciting as the opportunity to join this wonderful company and our even more AWESOME team! There’s lot’s of info for you to read up on over on my Join My Team page! Get a little reading under your belt and come join us this weekend – ready to learn and ask questions and HAVE FUN! I do hope you’ll join us for at least a part of the event – be sure to get joined into our Event page using the link above! Sale-A-Bration is THE BEST TIME OF THE YEAR to join the Stampin’ Up! Team! First off – you’ll get the Best “Bundle” EVER!! The Stampin’ Up! Starter Kit! The Starter Kit is always a great deal but it’s even better during Sale-A-Bration. You’ll get a WHOPPING $175 worth of product – that YOU choose!! – for just $99! (Hint: that’s $50 more than usual!!) And the kit ships totally FREE! But – this year, there’s also a SECOND Starter Kit OPTION! 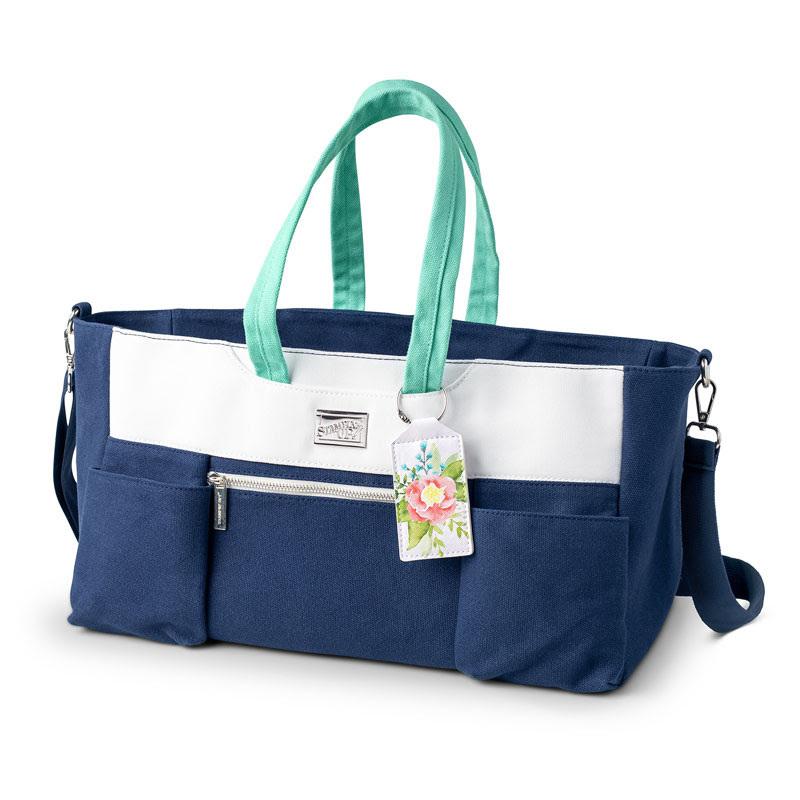 For just $30 more – you’ll get that $175 of products AND the new Craft & Carry Tote!! Want 20-25% discounts on everything you buy? CHECK! Maybe like to earn a little extra cash to support your habit? CHECK! Want New Catalogs and a chance to order new goodies before ANYONE else? CHECK! How’s about an opportunity to earn super awesome Incentive Trips? CHECK! Having tons of support from me when you need it (and…NOT when you don’t)? CHECK! Being part of a fun Krew of demonstrators? CHECK and CHECK! If you need a little help deciding which joining Option you’d like, check out this fun video! George will show you exactly why YOU’RE GOING TO WANT THIS AMAZING TOTE! !